Every Monday morning I hear a group of six to nine-year-olds yelling something like this to the lazy security guard across the street. It’s there own concoction of words that create a personal password to open the magical door that grants them access to a wonderland where they write their very own published stories. It sounds like every child’s fantasy, something that kids can dream about while boring themselves to death in math class or spelling, but it comes to life at Dublin’s very own Fighting Words. Fighting Words is a nonprofit organization that brings school groups in to write their very own personal stories. Here the students gather together, and develop a story as a group, and then create their own endings and illustrations on their own. It sounds cliche, but it’s as magical an experience for the volunteers as it is the students. This isn’t one of those things that I do because it looks good on a resume. Sure, it started as that, but what it morphed into, is this insanely beautiful experience where I get to immerse myself in the culture of Dublin, see the key differences between the youth of America and Ireland, and observe in amazement at how talented children really are, as long as you know how to pull those ideas out of them. Sometimes it’s like pulling teeth to get the children to realize their potential, to show them that there is more to creativity than what they saw online that morning, but the experience is something that is unrivaled by anything else. In a quiet nook of Northern Dublin, the majestic Fighting Words center lives. The program is beautifully organized, starting with kids gathering in the meeting area to get name tags and get their “about the author” pictures taken. They are then greeted by the volunteer who is in charge of the “magic door” for the day. This person is responsible for helping the kids come up with a password that will turn the magic door around (it’s a bookshelf that rotates, the kids are always trying to debunk it but we try our best). Once they develop the password, which is three original words that the students pick, like “Purple, Ice Cream, Donuts,” they have to gather at the window (so they don’t see said volunteer unhinge the rotating bookshelf) and yell to the “security guard” across the street to open the door. 90% of the time the kids are absolutely amazed. They then take their seats in the beautiful writing center, which is filled with bookshelves overflowing with literature and an art studio where the kids can draw. There they are greeted by their storyteller for the day. As if the kids didn’t have enough motivation to take home their own book as it is, they are introduced to the evil editor Mr. Mahonkey. Mr. Monhonkey never speaks to the kids, because he thinks they are just a bunch of “babies” that can’t write stories. He speaks to them from behind a wall, and tells them that he doesn’t think that they can do it, tells them that they smell bad and that he would NEVER publish a story written by a bunch of secondary schoolers. Negative reinforcement at its finest. The kids roar with outrage that anyone could ever have the audacity to tell them that they cant do something. It always sparks something in them, a divine interest in proving the grown-ups wrong. After that, it’s up to the storyteller to guide them through the creative process. Sorting through the children who are starving for attention, pulling muscles in their arms because they raise their hands with such ferocity with sparking ideas and the quiet kids who are too embarrassed to share their ideas. There’s the art of getting the shy kids to share, yet when they do, they always seem to dazzle the class with their unique and quiet ideas. In the corner, a volunteer illustrated puts there words into stunning pictures, making the kids see there creations come to life. The idea that these kids come up with are absolutely stunning. It takes a good thirty minutes to steer them away from writing about their favorite Pokemon or YouTube stars (seriously, what is with the youth today and wanting to be youtube stars?) but after that painful time, they dust off the cobwebs of the original parts of their brains and come up with things that adults wouldn’t be able to dream of. The other day, as a group, we wrote a story about Jack the three-legged ghost cow. Jack had a best friend who was a Pig with a ghost tail, and together they were teaming up to build a robotic leg for Jack so that he could be a four-legged ghost cow. Ironically, Jack the Ghosts cows biggest fear was flying, and he’s a ghost! It’s a brilliant idea, with conflict, dialogue, intriguing characters and it’s their very own. As volunteers we act as guides, helping them cross their t’s and dot their i’s. After an hour of contracting the first half of the story, we split up into small groups of two or three, and we help them either finish the story, illustrate the story on their own, or write their own ideas down. It doesn’t matter what they do, as long as they are creative, and now that we have spent an hour exercising those creative muscles, they are aching to make something of their own. It’s an insanely rewarding experience, watching these kids come in with a sense of wonder, and leaving with the confidence and awe that they just created something. There VERY OWN book. This entry was posted in Civic Engagement and tagged civic engagement, Ellen Oppenheim, Fall 2017, Fighting Words, Immersion, volunteer on November 6, 2017 by Lilly Johnsson. Studying with Champlain Abroad in Ireland has provided me with a million different opportunities, but I think the one I will always be the most thankful for was the opportunity to see myself as a part of something bigger. It’s intimidating, at first, I have to admit. To see how small you really are in the grand scheme of things. To see your life and your experiences as a just blip on the world’s radar. To realize you don’t know as much as you think you did… But then you realize that’s okay. Because everyone on the face of this earth, the whole global community, is just that: A bunch of blips. A bunch of blips with individual thoughts and ideas and experiences who are capable of coming together and making something out of nothing. It’s mind-blowing, really, when you start to think about it. So looking back now I can’t say I’m surprised that my first experiences with activism were abroad. I’ve always been a champion of causes, that’s for sure, but it took Ireland to teach me that democracy was not a spectator sport. That you had to really fight for what you knew was right, and that fighting involves putting feet on the ground. In Ireland, there’s a movement called Repeal the 8th. I had heard a little bit about it before my travels, but I never imagined how prevalent it would be when I actually arrived in Dublin. The 8th is a reference to the 8th Amendment of Ireland’s constitution, under which abortion in the state of Ireland is punishable by law and forbidden under any and all circumstances. It’s a law which has led to the wrongful death of many women, and each day more and more Irish women must leave their country for what some countries would consider routine medical care. Abortion has always been a touchy issue in the States, but at least we can say we have access. To see these women essential fighting for their lives with their government was heartbreaking, and it was in that moment I realized we were all blips. Blips brought together by an understanding of what it means to be a woman. I saw that we were our own global community, and in that spirit of kinship I wasn’t going to deny them. I wanted to stand with them in solidarity to get the legislation they deserved. So after months of marches and protests, I joined in the strike. Along with 18 other fantastic Champlain Dublin peers, we joined crowds of Irish men and women striking for the right to choose. We stopped traffic on the O’Connell St. Bridge and brought Dublin to a halt in demand of a referendum. To move as a collective body, and to be a part of that throng, is perhaps one of the single greatest feelings I have ever experienced. We made national news, and few of us even got to feature in a Buzzfeed listicle. A day later and I’m still glowing with pride. Pride for my Irish sisters and our shared femininity. Their referendum, when (not if) they get it, will never be mine to vote in. But I know it was never mine to begin with. All of this is so much bigger than me, bigger than us, and I’m so thankful I had a chance to participate. This entry was posted in Civic Engagement, Global Citizen and tagged civic engagement, Meghan Neely, Spring 2017 on April 11, 2017 by Lilly Johnsson. As a psychology major, I’m part of Champlain College’s EHS division. Dublin’s EHS course for this semester of junior year entailed getting a placement as a volunteer in a workplace that relates to our soon-to-be bachelors degree. I started working every Wednesday at the Island Key’s co-operative childcare program. This program is part of a government organization for subsidized housing, for people and families of low income. Many of the people living there are actually immigrants from places like Lithuania and Poland, although many are still local Irish who have lived in the Docklands their whole life. The Docklands used to be a working class neighborhood where many manual laborers were employed working on the docks, hence the name of the district. There was a period of industrialization that started replacing workers with machines which could get the job done faster. These workers became unemployed, thus turning the Docklands into a rather rough neighborhood, full of unemployed people who could no longer afford homes, and the school dropout rates rapidly increased. Any time I mentioned to an Irish person that I worked in the Docklands, I got the same uneasy reaction. I remember specifically one taxi driver telling me how it’s getting better now (due to these government organizations like affordable housing and childcare), but a few years back if you were an outsider walking down the street, “you’d find yourself naked before you even knew what happened”. The taxi driver was inferring by this that the people who lived there had a reputation for being really tough, and would steal literally everything from you, even your shoes….although the naked part was definitely an exaggeration. I actually really enjoyed because passing familiar faces and coffee shops after a while of the same routine became quite endearing and sweet. It was kind of a homey feeling, when I would pass business men and women living completely different lives, but still sharing a slice of our lives in common. After a while of recognizing one another, we would give each other a friendly nod, which is just one of those “it’s the little things” moments that makes me happy. Also as a side note, adopting some of the Irish ways while abroad can totally make one gain some weight, so that little time of exercise really pays off. Exercising also produces happy hormones, like dopamine, which is a nice way to de-stress. So, after the first few work days I got in the routine of getting to work without getting lost. I even became confident enough to take the bus when I felt like it, which turned out to be a completely positive experience. Shockingly enough the bus routes turned out to really not be that complicated after all. If you can look at the bus route diagram while simultaneously finding those stops on your google maps, you’re good to go. Now that half the battle of getting there was checked off the to-do list, It was time to finally start work. I was put in the classroom with the toddlers, where they can always use an extra hand. One minute you see them, the next they’re in corner…covering themselves with paint or something similarly inconvenient. About half of the toddlers first language was not english, even though they were just developing speech. This was interesting from a psychological perspective to observe how they found ways to work around the language barriers in order to communicate what they wanted or understand what we were saying to them. One really cute little boy in my classroom was from Romania and I watched him learn two languages at once. After being with the toddlers for a bit, I decided I wanted to try working with the older kids. I’ve worked as a pre-school teacher for younger ages before in previous jobs back in America, so wanted to try something new and get out of my comfort zone a little bit. This entry was posted in Academic & Courses, Civic Engagement, Global Citizen and tagged EHS 300, Fall 2016, service learning on January 11, 2017 by . Kelsey Hannemann (Criminal Justice’18) , Michael Roberts (Digital Forensics’18), and Tyler Bedard (Graphic Design’18) all study abroad students from Champlain College were taking part in the Creative Minds Hackathon, hosted jointly by the DCU Ryan Academy and the U.S. Embassy in Ireland. The goal of the 72-hour creative boot camp was to put hundreds of students’ and professionals’ brains together to help work towards a solution for refugee inclusion, integration and self reliance. Photo album from the Creative Minds Hackathon 2016, courtesy of U.S. Embassy Dublin. The theme itself certainly wasn’t the sole draw to this event however. “I thought it would be a good opportunity to reach out to more people and network and that kind of thing,” Hannemann stated, in regards to her personal reason for taking part. The event itself took place on 14th through the 16th of October, and was structured in a way that facilitated teamwork and networking the entire way. The first day of the Hackathon was spent acquainting with team members and fleshing out ideas for projects going forward. This entry was posted in Civic Engagement, Global Citizen, Global Professional and tagged Creative Minds, Fall 2016, Hackathon, US Embassy on November 2, 2016 by Zach Paulsen. Since Champlain College opened its abroad campus in Dublin, in 2008, over 700 students have studied with Champlain Abroad in Ireland for a semester. We decided to track some of them down for interviews about their experience in Dublin, and the impact that study abroad has had on their lives. David J. D’Angelo is a Champlain College alumni from the graduating class of 2012 who has been involved in entrepreneurial projects with companies including Somu Energy, Nanosynth Materials & Sensors, Data Mural, Intellectual Asset Partners, International Rescue Committee, United Nations, US State Department, US Homeland Security, Social Enterprise Greenhouse and Catholic Charities Migration & Refugee Services. Currently he resides in Salt Lake City, Utah, and is the founder of Somu Energy as well as the Entrepreneur in Residence at Intellectual Asset Partners. However, six years ago in the fall of 2010, he was just a third year Criminal Justice major from Ludlow, Massachusetts, arriving in Dublin for his first true abroad experience. I had the pleasure of interviewing David to get some insight on how studying abroad launched him into the successful life he leads today. Q: What made you decide to go to Dublin? Did the trip live up to that expectation? A: Early on in my undergraduate years, I felt challenged by the identity discovery process. I was pursuing a major that didn’t feel like the right fit. I was still figuring out who I was and who I aspired to be. And, at the time, I felt like a major change, like studying abroad, might propel me into discovering more about myself and the direction I wanted to take my academics and career. This was a chance to connect the dots. It was a chance to throw myself against the vulnerability of being in a new place, in order to understand more about myself. It was an opportunity to adventure and explore and find my purpose. A few close friends had already decided to commit to a semester abroad in Dublin. They were the ones who motivated me to seek out the experience in the first place. Without their push, I doubt I would have ever stepped foot into Ireland. And, thank god I did. David D’Angelo visiting the Guinness Storehouse with friends during his study abroad semester in Dublin. Going to Dublin was the best decision I ever made. It helped me feel comfortable when faced with the unfamiliar which later gave me the confidence to do things such as study in Thailand and launch a social venture in Nepal. Dublin was the first step of international exposure that I took, and it has since fueled my desire to see more of the world. Q: What were some of your apprehensions or ‘Big Unknowns’ before you came abroad? This entry was posted in Champlain Dublin Alumni, Civic Engagement, Global Citizen, Global Professional and tagged Amanda Hollywood, Champlain Dublin Alumni, David D'Angelo, Spring 2016 on May 12, 2016 by Lilly Johnsson. In true Champlain College fashion, Champlain Abroad Dublin offers so many events to its students. This past semester there have been tons of things to do! When Monday rolls around, the big calendar in the Academic Center is filled to the brim with new and exciting activities happening all around Dublin. Believe me when I say there’s something for everyone; you’re never left wondering where’s the craic? 27 Champlain students laced up their running shoes and participated in Run in the Dark Dublin. Champlain students have gone to Northern Ireland and the west coast of Ireland. We’ve immersed ourselves into one of Ireland’s biggest traditions: Gaelic spots. Other activities this semester have been hikes, day trips to the towns of Bray and Dún Laoghaire, volunteering at the Web Summit, karaoke at local pubs- the list goes on! This entry was posted in Activities, Civic Engagement and tagged civic engagement, Fall 2015, Run in The Dark on November 23, 2015 by Sarah Steward. 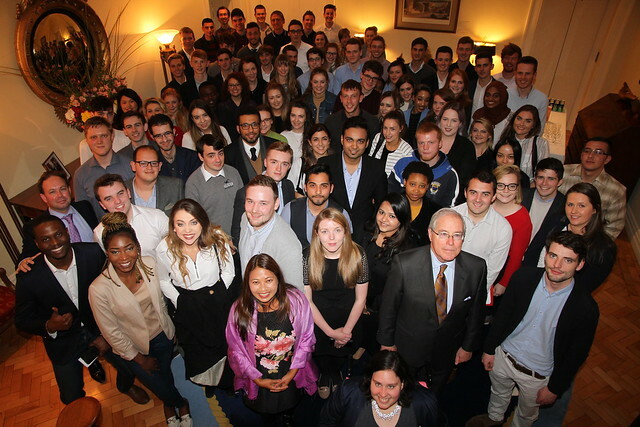 Dublin is a city brimming with opportunity; and upholding Champlain Abroad’s motto to explore, immerse, and engage has proven easy and rewarding. Within one month of arriving, I was making my way to class without a worry about how to get there, being asked for directions, and claiming little corners of the city as my own. There is a familiarity to this place, and the feel of locality has made itself immortal. It goes beyond the trad sessions in pubs and classroom or group excursions; it reaches into volunteerism, as well. I haven’t volunteered steadily anywhere since high school, but Champlain Abroad makes the chance to do so more than available and the staff are wonderful in helping students find the place for them. And there are a host of places that Champlain has worked with in the past, but there is also room to research organizations in the area! From the beginning, when looking at the list of programs Champlain suggested on the post-acceptance application, I was interested in spending a couple of hours a week at Fighting Words—and it couldn’t have been a better decision on my part to sign up. So far, I have volunteered at three Fighting Words sessions, already looking forward to the others that lie in store for me. Co-founded by Irish author Roddy Doyle and Seán Love, Fighting Words offers free creative writing tutoring and workshops to children and young adults. They often host events in the center as well as around Ireland, and have specific times set up each day for primary and secondary school students to come in and write. On Monday afternoons, high school students from literally all over the country come for two hours, and as volunteers we sit with a group and act as a set of eyes and ears that isn’t a teacher or other authority figure. This entry was posted in Civic Engagement, Global Citizen and tagged Fall 2015, Fighting Words, volunteer on November 12, 2015 by Lindsay Maher.